One of the most famous names in Single Malt Whisky, Macallan has beguiled drinkers the world over with its characteristic rich sherried flavours, lengthy history and elegant presentation. The preferred whisky by James Bond, and once chosen to be the official whisky of the Speaker of the House of Commons, Macallan brings a touch of class to even the most sophisticated of settings. With a history going back to 1824, The Macallan is one of the biggest operations in Scottish whisky distilling, ranking as either the 2nd or 3rd largest production capacity of malt whisky, just behind Glenlivet and Glenfiddich, with 27 stills. Affectionately known to some drinkers as "Big Mac", the distillery probably started as a small scale farmer’s side-project, as many whisky producers did. Easter Elchies House, first built in 1700, now features on every bottle of whisky, is at the centre of the distillery’s grounds. Near this house, there was a ford where cattle drovers would would cross the river Spey- they would also often seek some rest and foot from local farms, sampling the local whiskies. From these humble beginnings, Macallan has gone on to become one of the very best respected brands in the industry. Notably, the Macallan is almost certainly the most collectable whisky in the world. Entire books are dedicated to the locating, verifying and purchasing of vintage Macallan. 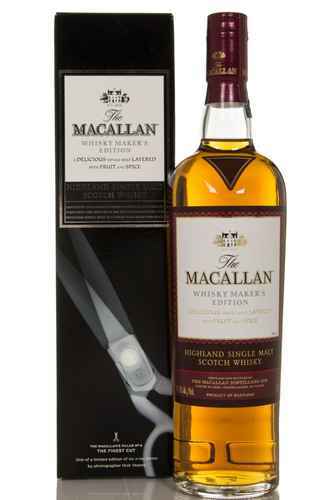 Bottles of old Macallan have consistently set world record prices at auction and sale: in 2010, a bottle of 64 year old Macallan sold at Sotherby’s for over $460,000, later beaten by a decanter of "M" which sold for $628,205 in 2014. Macallan’s "Fine and Rare" series – a collection of extremely old vintage bottlings, some dating back to 1926 – is some of the most sought after whisky in the world, with even 50ml miniatures reaching over £500 repeatedly at auction. It is difficult to overstate the stature that old Macallan whiskies have in the whisky collecting world, and this forms a large part of brand’s considerable prestige. Macallan has ensured its quality through a few meticulous methods. Paramount amongst these is the distillery’s emphasis on using the highest quality casks available. Whilst sherry has fallen out of favour, sherried whiskies are extremely sought after, and Macallan decided to secure their supply by purchasing a sherry bodega in Spain to "season" their casks. They also planted a Woodland Estate of oak trees in near their Speyside distillery to raise awareness of the scarcity of these trees, and the Scotch industry’s obligation to sustainability. Furthermore, the Macallan employs a Master of Wood to ensure that all their casks pass muster. The distillery’s distinctive small stills play a crucial role in creating their typically fruity spirit. The Macallan also takes an extremely small cut of the spirit, around 16%, guaranteeing that only the best quality new make goes into their product. These precise and painstaking techniques have ensured that the Macallan is one of the most esteemed distilleries in Scotland. The distillery first gets its license, the moment now seen as its founding, with Alexander Reid. To allow for this, Reid leased eight acres of land from the Earl of Seafield, who owned much of the land in the area. The Macallan name (derived from a combination of two Gaelic words "Magh", meaning fertile, and "Ellen", meaning of St. Fillan, an Irish monk who spread Christianity around Scotland in the eighth century) did not come until later however, with the distillery first known as Elchies Distillery. At this point the distillery was operating out of the farm buildings around Easter Elchies House, and Reid himself was a local famer and school teacher. The oldest bottle in the Macallan archive (and almost certainly the oldest bottle of Macallan extant) is bottled. After Alexander Reid dies, ownership and management passes to James Shearer Priest and Jame Davidson, both of whom were also locals of the area, as Macallan maintained a close bond with the land and people of the area. Easter Elchies house is extended substantially, with 29 rooms added by 1861. James Stuart purchases the distillery, later completing the purchase of the distillery grounds from the Seafield family in 1886. Stuart would also found the Glen Spey distillery in 1878. The distillery is visited by Alfred Barnard. He mentions its similarity to Glen Spey, and that by this point it was producing close to 200,000 litres of whisky annually. Even here, Barnard describes it as an "old-fashioned establishment" highlighting the long held Macallan principle of tradition. Roderick Kemp, identified by many as the man who first brought The Macallan global recognition, buys the distillery. Kemp would ensure that the Macallan was known for an emphasis on high quality and excellent products. Kemp had previously worked and partly owned Talisker, and expanded the distillery. He renamed the distillery Macallan-Glenlivet, no relation to the Glenlivet we know today, this was a popular term at the time to suggest a quality product. Kemp dies, leaving the business to be managed in trust by the Shiach and Harbinson families. After surviving the economic blows of two world wars and prohibition in American, The Kemp Trust gives way to a limited company called R Kemp, Macallan-Glenlivet Ltd. The first real period of great success for Macallan, as sales begin to rocket, leading to the distillery expanding its stills over the next decade and into the 60s. In 1965, Macallan was producing whisky from 12 stills. Having first been the ancestral home of the man who owned the distillery land, a historic inversion occurs as the distillery buys Easter Elchies House and the estate surrounding it. The house was uninhabited and had fallen into a sad state of disrepair. The Macallan is floated on the London Stock Exchange. This decade sees another period of expansion for the distillery, increasing the still number to 18, before further increasing it to 21. The chairman of the Macallan Board changes to Allan Schiach, a descendant of the famous Roderick Kemp. Like Kemp he oversees a period of revolution in the Macallan’s history. Around this time the first Macallan advertising campaign appears in the UK, featuring next to the crossword in the Times. The distillery name changes, dropping the "Glenlivet" suffix to become simply "The Macallan." This is accompanied by a huge marketing campaign by the distillery. The famous 18 year old bottling is released. The now renovated Easter Elchies House re-opens. Suntory, the Japanese whisky giant, buys a quarter of Macallan’s stocks. Highland Distilleries purchase the rest of the stocks, finally ending the Kemp family’s interests in the distillery after over a century. Macallan begins to release whisky based on replicas of the antiques bottles found in their collection, starting with the 1874 Replica. Edrington and William Grant purchase Highland Distilleries. The distillery releases a single cask whisky for the first time, named ‘Exceptional 1’. During the ‘Noughties’ the distillery continued to release ‘Replica’ editions of the ‘oldest’ whiskies in the Macallan collection. A minor scandal arose amongst whisky drinkers when it was revealed by carbon dating that some of these original whiskies, upon which the replicas were based, were fakes. 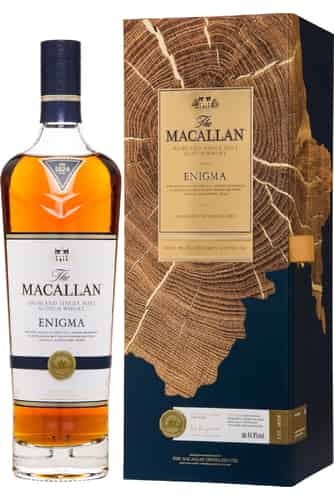 The real replicas however, such as "The 1874", which was first released in 1997 have been widely acclaimed as works of blending genius with Macallan’s "Chief Noser" Frank Newlands creating a remarkable copy of the ancient bottling from current stocks. Easter Elchies house is refurbished again, and the ‘Master of Wood’ visitor centre opens up in warehouse 7. A second production house is rebuilt, and new warehouses added, increasing the production of the distillery. A bottle of Macallan 50 Year Old plays a starring role in ‘Skyfall’, the 50th James Bond film, with the Macallan receiving a film credit!